The series editor was Lewis Einstein (1877–1967), a diplomat and historian. The books were set in Montallegro, a typeface designed specifically for Updike by architect, art collector and art historian Herbert Horne (1864–1916). Montallegro was modelled on an early Florentine font and cut by Edward Prince. It was first used in Life of Michelangelo Buonarroti by Ascanio Condivi (Boston: The Merrymount Press, 1904) before being employed for The Humanists’ Library. In Printing Types, Updike says of Montallegro that, like the other types designed by Horne, it “attacked the problem of what a fine type for commercial printing should be—elegant, yet readable from a present day standpoint.”  Horne also designed the initials and the colophon device used in The Humanists’ Library books. 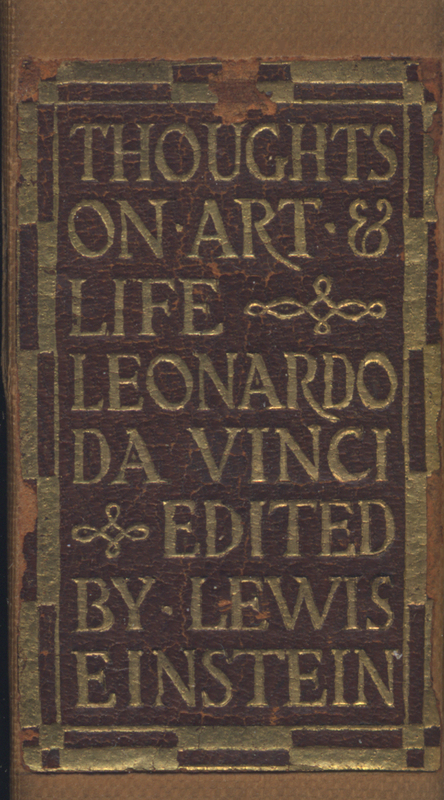 Title page of Thoughts on Art & Life by Leonardo da Vinci (Boston: The Merrymount Press, 1906). 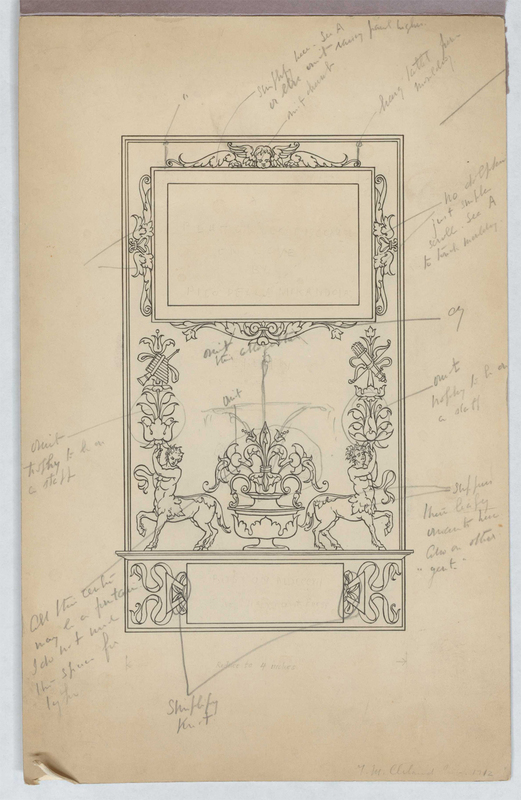 Frame design by Herbert P. Horne. But Horne was not the only artist to work on the books in the series. Thomas Maitland Cleland (1880–1964) and W.A. Dwiggins (1880–1956) also contributed to several of them, both in ways that have been publicly acknowledged and in ways that have not. The true story of their contributions reveals tangled histories of not only the productions of some of the volumes, but also of the relationships among the two men and Updike. The books are all distinguished by title pages sporting frames and classical illustrations in red. With the exception of the last book in the series, the designs are not signed. The colophons for the da Vinci, Erasmus and Petrarch all state that they were made “with types & decorations by Herbert P. Horne” implying that the title pages were Horne’s work. The colophons for the other titles explicitly credit Dwiggins and Cleland for their title page designs: Dwiggins for The Defence of Poesie, The Correspondence of Philip Sidney and Hubert Languet, and the Dürer; and Cleland for A Platonick Discourse upon Love and A Renaissance Courtesy Book. 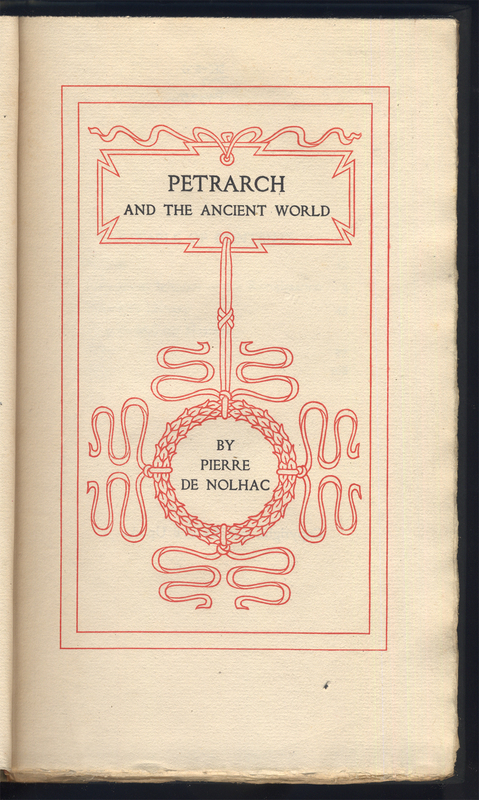 Title page of Petrarch and the Ancient World by Pierre de Nolhac (Boston: The Merrymount Press, 1907). Frame by Herbert P. Horne. “Petrarch” by W.A. Dwiggins. There is no mention in the colophons or in Smith’s bibliography of the label designs on the bindings. Although Thoughts on Art and Life was published in December 1906, Dwiggins wrote to Updike in April of 1907 that he was sending a drawing for “the Leonardo cover”. There is no other record for this drawing that I have been able to locate, and the timing of it is peculiar. But it may refer to the label on the spine of the book. Several months earlier, Updike had asked Cleland to do a title for the da Vinci book and sent him the Petrarch as a guide. “Of course,” he wrote, “it is important that the lettering be kept as uniform in spacing as is possible. The label can be a little longer than this if desired; but should be no shorter.”  Cleland sent him the lettering on November 26, 1906. That is the last reference between the two men about the label. Presumably, the label as printed bears Cleland’s lettering and Dwiggins was not asked to revise it—but, based on the history of other books in the series, such a possibility cannot be ruled out entirely. 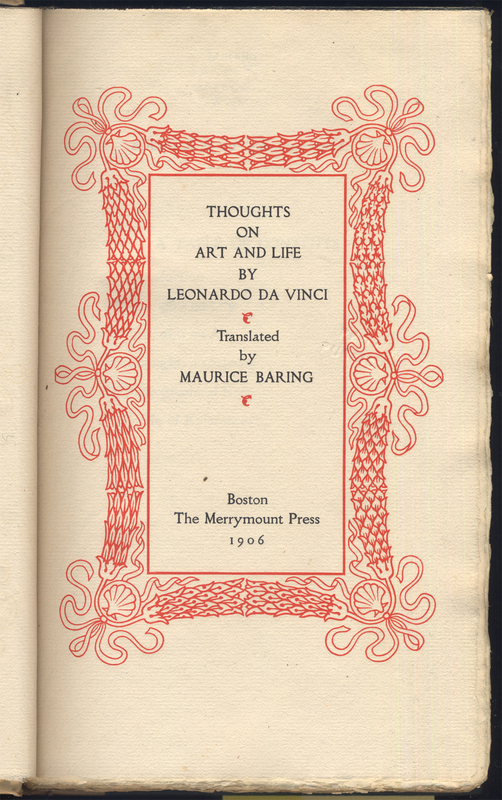 Label from spine of Thoughts on Art and Life by Leonardo da Vinci (Boston: The Merrymount Press, 1906). Lettering by T.M. Cleland. Label on spine of Petrarch and the Ancient World by Pierre de Nolhac (Boston: The Merrymount Press, 1907). Lettering by W.A. Dwiggins. The lettering on the Petrarch label is different from that of the da Vinci (note the R especially) which suggests that the latter is Cleland’s work and not Dwiggins’. One aspect of the Petrarch label that is interesting is the use of ligatures and nested letters, as well as hyphenation. The latter would become a hallmark of Dwiggins’ spine lettering for Alfred A. Knopf, Inc. decades later. 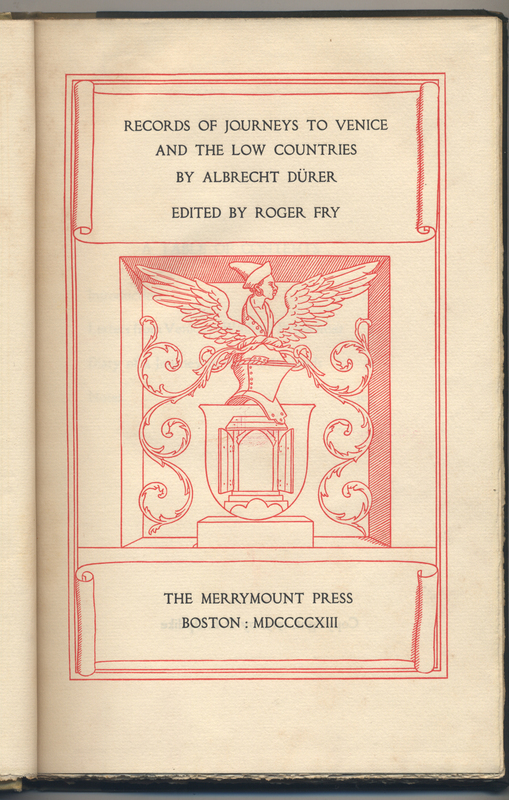 Title page of Against War by Erasmus (Boston: The Merrymount Press, 1907). Decoration by Herbert Horne with lettering within ribbons by T.M. Cleland; title lettering by W.A. Dwiggins. Only Cleland’s lettering for the motto ended up being used. In March, for some unknown reason, Updike asked Dwiggins to work on the title of Against War. Dwiggins sent lettering for it on March 21, but did not receive a response from Updike until several months later. On June 7, he told Dwiggins that he thought the “Erasmus against War lettering… is still pretty weak.” Two weeks later, he reiterated his dislike of Dwiggins’ work: “I do not altogether like the lettering for the Erasmus title-page, because it does not match my type closely enough.” Furthermore, he wanted “Desiderius” deleted. In the end, Dwiggins satisfied Updike, achieving lettering of the author and title that is astonishingly close to that of Montallegro. The only tell-tale signs are the width of the M and the overall scale of the letters. 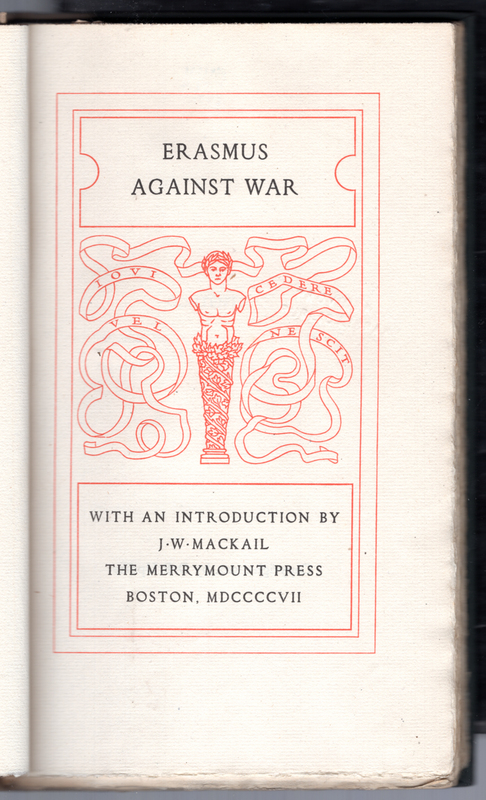 Label for spine of Against War by Erasmus (Boston: The Merrymount Press, 1907). Lettering by W.A. Dwiggins. In the same letter in which he complained about the fidelity of Dwiggins’ lettering to the Montallegro type, Updike opposed the breaking of “Against” on the label which Dwiggins was working on simultaneously. Apparently, he did not mind the hyphenation of “Erasmus” or “Mackail”. He also did not insist that the lettering match the Montallegro type. Updike provided his critique eleven days later, a lengthy description of how Dwiggins could fix the design. Among other things, he complained that “the moldings look a little like Cleland’s things.” He concluded the letter by apologizing: “I am sorry to be so fussy.”  Dwiggins took Updike’s comments to heart and completed the design by the end of the month. The label for the spine presented little trouble as Updike allowed the title to be simplified to The Defence of Poesie, etc. and neither it nor the author’s name required any shortening. 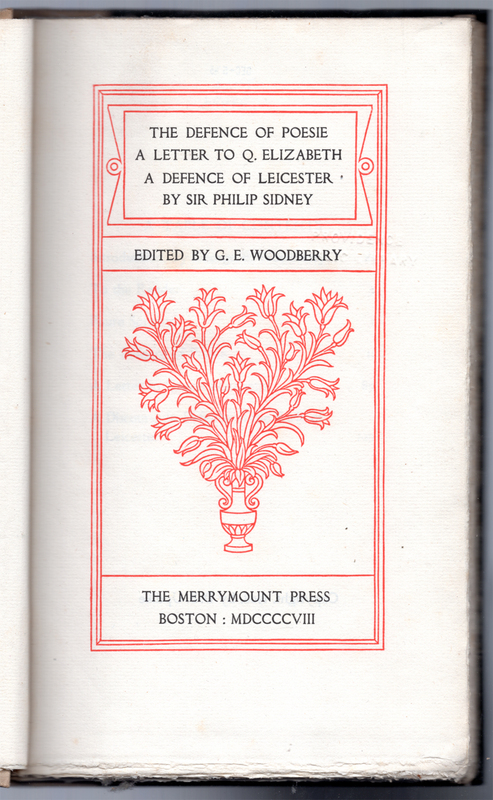 Title page of The Defence of Poesie… by Sir Philip Sidney (Boston: The Merrymount Press, 1908). Title page design by W.A. Dwiggins. Label for spine of The Defence of Poesie, etc. by Sir Philip Sidney (Boston: The Merrymount Press, 1908). Lettering by W.A. Dwiggins. 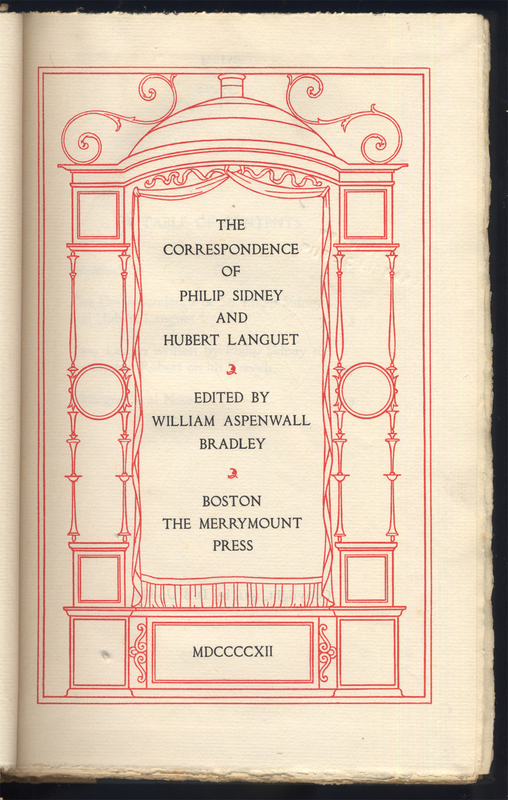 Title page of The Correspondence of Philip Sidney and Hubert Languet (Boston: The Merrymount Press, 1912). Frame designed by W.A. Dwiggins. 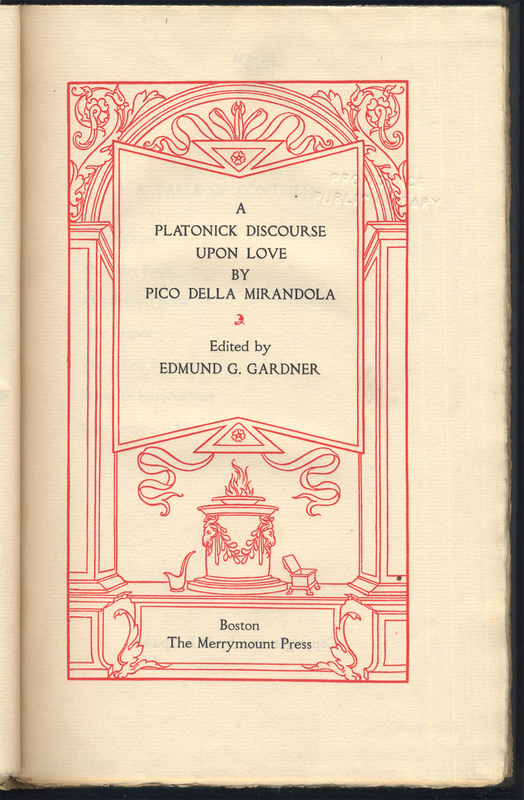 Title page of A Platonick Discourse upon Love by Pico della Mirandola (Boston: The Merrymount Press, 1913). Frame by T.M. Cleland. Pen and ink sketch by T.M. Cleland for frame for an unspecified title in The Humanists’ Library. November 1912. Despite his avowed willingness to revise the sketch according to Updike’s extensive criticisms, Cleland must have been miffed. The design lay fallow for over a year. Title page of Records of Journeys to Venice and the Low Countries by Albrecht Dürer (Boston: The Merrymount Press, 1913). Design by W.A. Dwiggins. Label for Records of Journeys to Venice and the Low Countries by Albrecht Dürer (Boston: The Merrymount Press, 1913). Lettering by W.A. Dwiggins. On the last day of 1913, Updike wrote to Cleland, asking him what had happened to the title page design for the Galateo. He was willing to use the second design that he had so heavily marked up if Cleland did not have time to revise it as he had promised. Cleland quickly replied that he did not like the old design and did not have time to fix it as requested. Instead he offered to make a new, simple design that he hoped Updike would like. On January 9, 1914 he sent it out. Three days later, Updike told him that he was “delighted” with the design for the Galateo title page. Cleland’s frame for the title page of A Renaissance Courtesy-Book is the only design in The Humanists’ Library that is signed—see the small C in the bottom center. 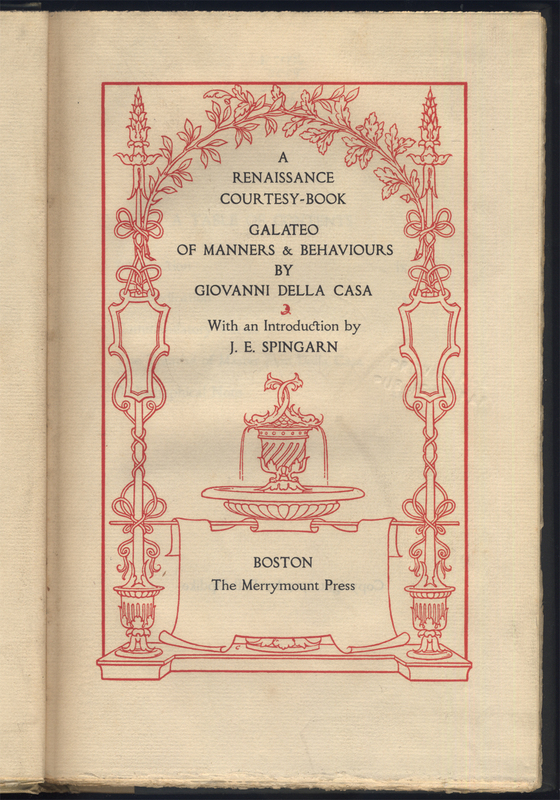 Title page of A Renaissance Courtesy Book: Galateo of Manners and Behaviours by Giovanni della Casa (Boston: The Merrymount Press, 1914. Frame design by T.M. Cleland. 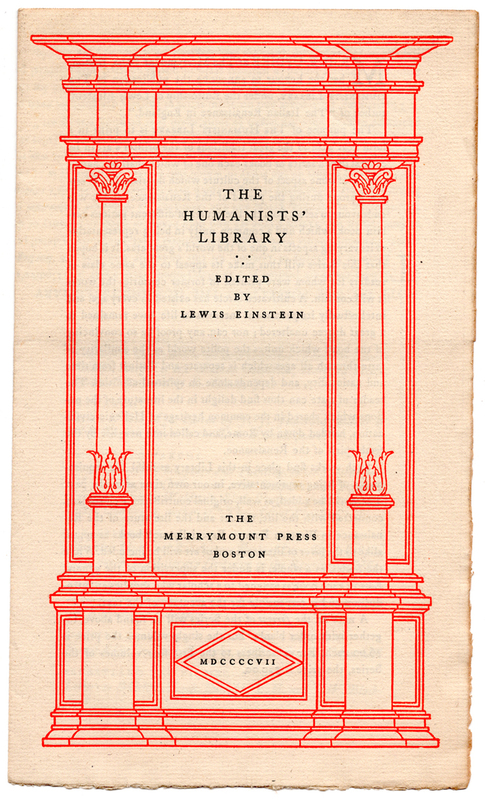 Cover of circular for The Humanists’ Library (1917). The Smith number in brackets for each title in The Humanists’ Library refers to entries in “Bibliographical List of Books Printed at the Press” by Julian Pearce Smith in Notes on the Merrymount Press & Its Work by Daniel Berkeley Updike (Boston: The Merrymount Press, 1934). See pp. 124, 133, 134 and 138 for the first series; and pp. 160, 164, 166 and 168 for the second series. Printing Types: Their History, Forms, and Use: A Study in Survivals by Daniel Berkeley Updike (Cambridge, Massachusetts: Harvard University Press, 1922), vol. II, pp. 214–215. Thoughts on Art and Life is announced as ready in an advertisement in the December 13, 1906 issue of The Nation (p. vi). Dwiggins to Updike 5 April 1907, Letter 108:48, Box 69, The Merrymount Press Collection, The Huntington Library. Updike to Cleland 22 November 1906 and Cleland to Updike 26 November 1906, Folder 1906 Updike letters, Box 21, Thomas Maitland Cleland Papers, Manuscript Division, Library of Congress. Entry for 19 November 1907, Dwiggins account book, Folder 2, Box 81(1), 1974 Dwiggins Collection, Boston Public Library. Updike to Dwiggins 19 November 1907, Letter 108:110, Box 69, The Merrymount Press Collection, The Huntington Library. Entry for 3 October 1907, Dwiggins account book, Folder 2, Box 81(1), 1974 Dwiggins Collection, Boston Public Library. Updike to Dwiggins 17 October 1907, Letter 108:97, Box 69, The Merrymount Press Collection, The Huntington Library. Updike to Cleland, 24 January 1907 and 26 January 1907, Folder–1907 Updike letters, Box 21, Thomas Maitland Cleland Papers, Manuscript Division, Library of Congress. Cleland to Updike, undated letter; Cleland to Updike, 8 February 1907; and Cleland to Updike, 17 February 1907, Folder–1907 Updike letters, Box 21, Thomas Maitland Cleland Papers, Manuscript Division, Library of Congress. Entry for 13 March 1907, Dwiggins account book, Folder 2, Box 81(1), 1974 Dwiggins Collection, Boston Public Library. Dwiggins to Updike, 21 March 1907, Letter 108:46; Updike to Dwiggins, 7 June 1907, Letter 108:67; Updike to Dwiggins, 22 June 1907, Letter 108:72, Box 69, The Merrymount Press Collection, The Huntington Library. A proof of the title with “Desiderius” survives in the Updike Collection, Providence Public Library. Entry for 12 June 1907, Dwiggins account book, Folder 2, Box 81(1), 1974 Dwiggins Collection, Boston Public Library. Dwiggins to Updike, 21 June 1907, Letter 108:71, Box 69, The Merrymount Press Collection, The Huntington Library. Cleland resigned his position as Art Director of McClure’s in November 1908. Cleland to Updike, 6 November 1908, Folder–1908 Updike letters, Box 21, Thomas Maitland Cleland Papers, Manuscript Division, Library of Congress. Updike used Cleland after this, but not to the same extant he had before 1907 and far less than he used Dwiggins during the years 1907–1912. Entry for 27 November 1907, Dwiggins account book, Folder 1, Box 81(1), 1974 Dwiggins Collection, Boston Public Library. Dwiggins to Updike, 11 December 1907, Letter 108:117; Dwiggins to Updike, 4 January 1908, Letter 108:135, Box 69, The Merrymount Press Collection, The Huntington Library. Updike to Dwiggins, 15 January 1908, Letter 108:144, Box 69, The Merrymount Press Collection, The Huntington Library. Updike to Cleland, 19 August 1912, File–1908–1912 Updike letters, Box 21, Thomas Maitland Cleland Papers, Manuscript Division, Library of Congress. Dwiggins to Updike, 6 August 1912, Letter 108:487, Box 69, The Merrymount Press Collection, The Huntington Library. There is no entry for the title page of The Correspondence of Philip Sidney and Hubert Longuet in Dwiggins’ account books due to a gap in the record between 3 January 1911 and 14 August 1912. For the label see the entries for 16 November 1912 and 22 November 1912, Dwiggins account book, Folder 2, Box 81(1), 1974 Dwiggins Collection, Boston Public Library. Cleland to Updike, 20 August 1912, File–1908–1912 Updike letters, Box 21, Thomas Maitland Cleland Papers, Manuscript Division, Library of Congress. Updike to Cleland, 26 August 1912, File–1908–1912 Updike letters, Box 21, Thomas Maitland Cleland Papers, Manuscript Division, Library of Congress. There is no surviving record as to what Dwiggins was paid for the Sidney and Languet title page. He received $5 for the design of the label. Cleland to Updike, 28 August 1912; Updike to Cleland, 3 September 1912, File–1908–1912 Updike letters, Box 21, Thomas Maitland Cleland Papers, Manuscript Division, Library of Congress. Cleland to Updike, 28 October 1912 and 12 November 1912, File–1908–1912 Updike letters, Box 21, Thomas Maitland Cleland Papers, Manuscript Division, Library of Congress. Updike to Cleland, 14 November 1912, File–1908–1912 Updike letters, Box 21, Thomas Maitland Cleland Papers, Manuscript Division, Library of Congress. Cleland to Updike, 18 November 1912; Updike to Cleland, 29 November 1912, File–1908–1912 Updike letters, Box 21, Thomas Maitland Cleland Papers, Manuscript Division, Library of Congress. The drawing is loose in Folder—Updike: undated letters, notices and miscellaneous items, Thomas Maitland Cleland Papers, Manuscript Division, Library of Congress. See the entries for 15 August 1913 and 16 November 1913, Dwiggins account book, Folder 2, Box 81(1), 1974 Dwiggins Collection, Boston Public Library. Updike to Cleland, 31 December 1913; Cleland to Updike, 3 January 1914; Cleland to Updike, 9 January 1914; Updike to Cleland, 12 January 1914, Folder 1913–1914 Updike letters, Thomas Maitland Cleland Papers, Manuscript Division, Library of Congress. I have not come across any documents regarding the labels for both the Pico della Mirandola and Giovanni della Casa titles, but the lettering appears to be that of Cleland based on the form of the R. Unfortunately, the labels I have seen are in poor condition. Entry for 4 January 1907, Dwiggins account book, Folder 2, Box 81(1), 1974 Dwiggins Collection, Boston Public Library. Label for A Platonick Discourse upon Love by Pico della Mirandola (Boston: The Merrymount Press, 1914). Lettering probably by T.M. Cleland. Label for A Renaissance Courtesy-Book: Galateo of Manners & Behaviours by Giovanni della Casa (Boston: The Merrymount Press, 1914). Lettering probably by T.M. Cleland. I want to thank Martin Hutner for allowing me to scan his copies of The Humanists’ Library books. This was especially important since the labels have never been reproduced before.